All themes are well optimized for all device screen sizes. They look stunning on iPhone, iPad, Android or any other device. Additionally, to create this list we went through 500 different themes and we selected the best ones based on dozens of criteria. 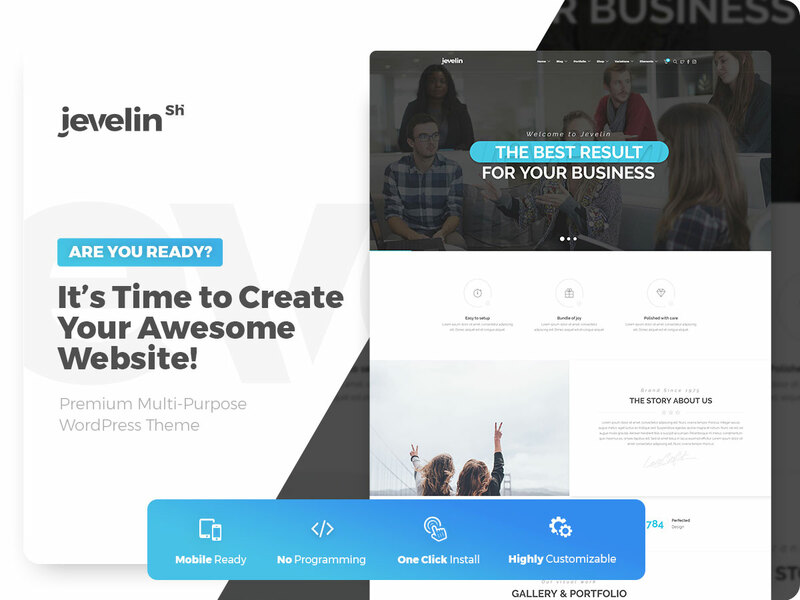 Jevelin is a highly customizable and beautifully designed, engaging and dynamic, intuitive and rapidly responsive WordPress premium multipurpose website theme. It’s an incredibly resourceful tool for the easy and professional quality development of a variety of different websites spanning multiple fields and interests with utter competence and crafty convenience all about. With Jevelin, building a website is as easy as selecting your preferred demo website and page templates and then customizing as thoroughly as you wish in terms of graphical branding, animation and styling, layouts and arrangements, on top of dozens of functional shortcodes and much more under the hood. AJAX technologies, HTML5 coding and CSS3 scripting provide Jevelin with a vast array of advanced tools for you to deploy, such as a fluid Back to Top customizable feature, Parallax hardware-powered smooth scrolling to keep your content captivating and your audience engaged, and convenient unification of a range of options across the entire theme if you so desire, allowing for speedy and uniform styling for your pages and elements. Jevelin even includes a modern and convenient page notice option regarding cookies, to comply with the latest relevant legislation from all over the world. Give Jevelin a go today, and find out! 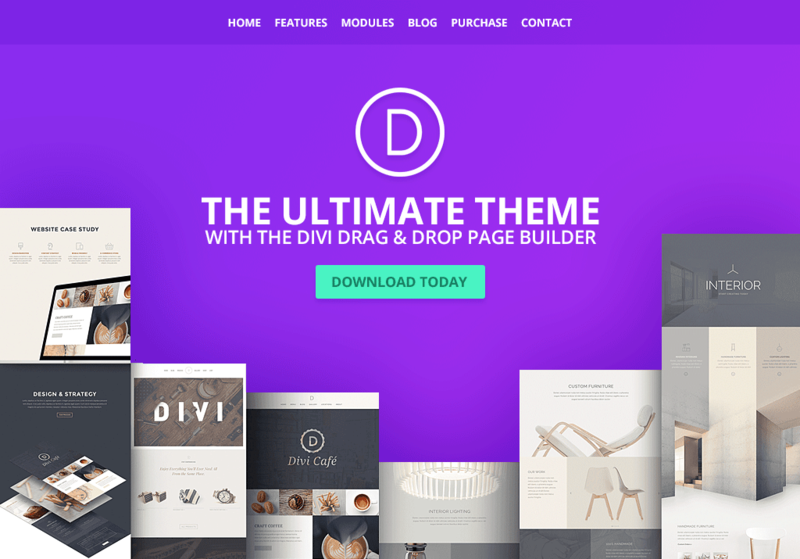 Without a shred of doubt, Divi is one of the most flexible, powerful, and accessible Fullscreen WordPress themes. This product offers countless options for website personalization, and it is capable of adapting to any role or market niche. Not even the sky can limit you, given that there are 46 basic content modules which can be arranged and combined in any way. This theme basically functions like a child’s building block set, and all blocks can be managed via the Divi Builder tool. Your fullscreen site can incorporate a full-width Post title, slider, portfolio, or post slider. Users will always trust the opinion of other consumers, rather than the polished advertisement of the business owner. For your articles or products, a testimonial section can be easily added. Divi can include specific sections for videos, post titles, pricing tables, and even a specific search function. If your aim is to sell as many items as possible, you can design an online shop section for your web page. With this theme, your fullscreen site will have an email op-in feature, a login function, and a specific contact form. Audio players can provide sample tracks, while countdown timers can tease upcoming events. 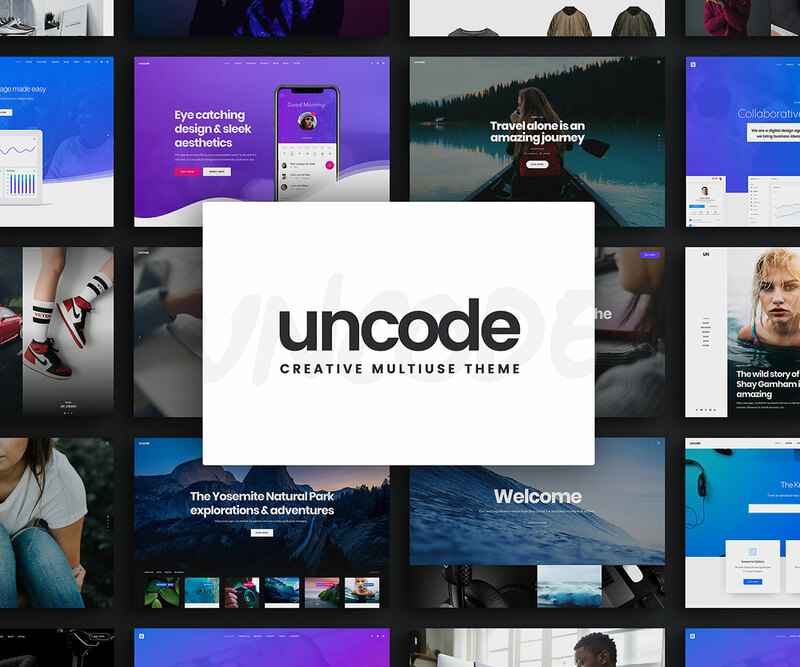 Uncode is a completely visually awe-inspiring and ravishingly beautiful, supremely engaging and experientially enveloping and immersive, technologically cutting edge and innovative, inherently modern and current, conceptually unique and entirely responsive WordPress multiconcept, multipurpose website theme. It’s a notoriously powerful theme that can effortlessly muscle the demands and requirements of websites big and small, simple and complex, personal and corporate, with equal ease and speed, featuring HTML5 elements, a dynamic CSS3 scripted style and animations and jaw-dropping Parallax visual elements and scrolling, and extensively customized, premium plugins like an enhanced Visual Composer, the Revolution Slider and Layer Slider, and an integrated WooCommerce platform, all dressed to match Uncode’s graphical environment. Uncode’s strongly cohesive visual identity, which sets Uncode websites apart from the rest and ensures your website will stand out and get noticed. Uncode is also extremely deft and dexterous when it comes to presenting beautiful fullscreen websites and pages, with a wealth of fullscreen features and demo websites and templates, as well as powerful fullscreen layout options, immersing your audience completely in your website experience, which in turn results in higher conversion rates and a better, more meaningful processing of your content by your audience, and isn’t that what it’s all about? Kalium is a beautiful and visually stunning, sleek and aesthetically appealing, highly responsive WordPress creative multipurpose portfolio and online shop website theme. 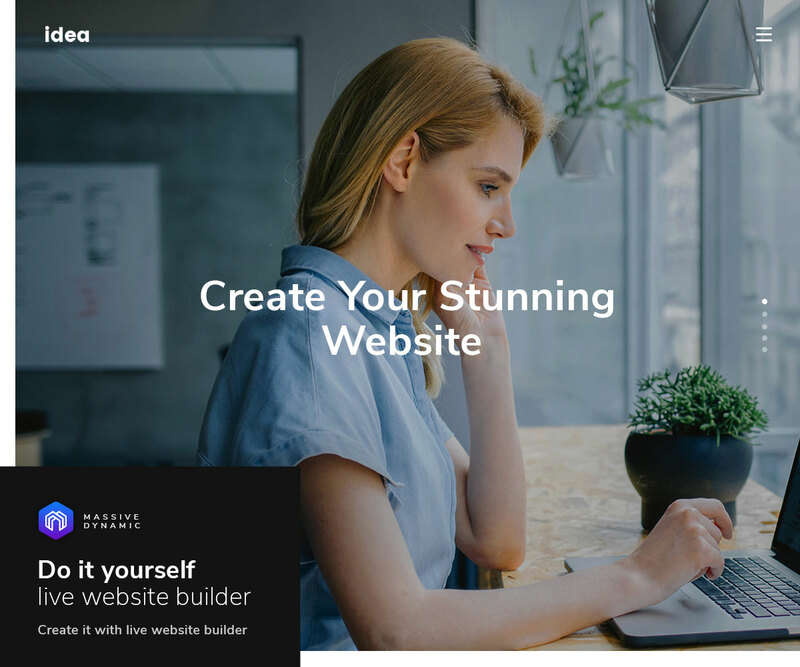 It’s a fashionable and current, very creatively inclined website building platform, ready to offer you complete visual freedom and unbridled creative power over a multitude of possible website styles and archetypes across all sorts of industries and fields. With a wealth of professionally designed, readymade demo websites filled out with inner content pages as well as specific, purposeful template pages for all sorts of niche applications, as well as the extremely easy to use drag and drop Visual Composer page builder to aid you in customizing your layouts or crafting entirely new ones, makes Kalium an ally to webmasters with no previous coding experience. The Revolution Slider and LayerSlider premium plugins are included at no added cost, allowing for the hassle-free creation of endless amounts of customized sliders to keep your users engaged. Speaking of user engagement and enveloping end-user experiences, Kalium has a smooth, unparalleled fullscreen capability that will allow your visitors to lose themselves in your website, regardless of its nature or business. 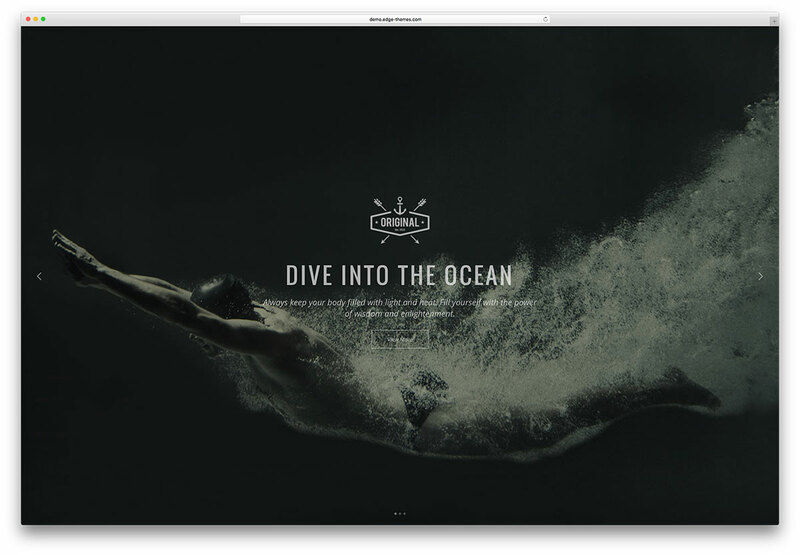 Try Kalium now, and let the world immerse itself within your website! wonderfully responsive WordPress creative multipurpose website theme. This theme is a tech-savvy solution for webmasters from any background and with or without previous web development experience to easily and effectively put together sophisticated websites in a matter of minutes, with deep-running features and complex functionality built right in with not a single line of coding required. 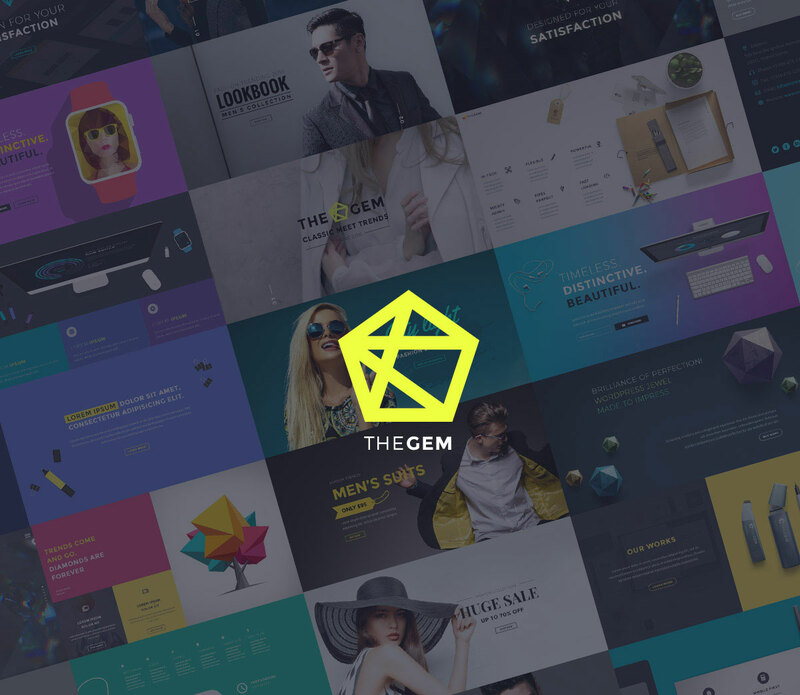 TheGem is perfect for creating your landing pages, whether they are for incoming traffic generated by an app, a digital marketing campaign, a coupon marketing campaign or any other source. It’s Parallax-powered, seamless visual styling and effects make it an absolute beauty to behold, particularly considering its handsome fullscreen capacities, which permeate every page and element within TheGem and allow for complete fullscreen landing page performance at a very high level. TheGem has been based on HTML5 and CSS3 to guarantee perfect handling of all sorts of audiovisual content, while AJAX powered features such as advanced filtering and searching give your visitors the ability to make their way about your content, regardless of its size or scope. With TheGem at your side, you’ll craft the most engaging landing pages of the web, in fullscreen glory! Studio 8 is one of the best themes on the market. It enables its user to construct jaw-dropping fullscreen sites, and there is no entry barrier. No coding or web knowledge is required, as even a child can craft a successful page. Studio 8 has a sizable roster of useful features, each promising to enhance your experience as a site owner. It is possible to implement custom backgrounds in order to impress all potential clients. Upon installation, you can expect frequent updates which promise to fix errors or further expand the site’s capabilities. HTML files were incorporated, along with several personalized post types. The code is well-written and streamlined, and there is a powerful drop-down menu for all users. Studio 8 has threated comments for posts, and it was constructed with SASS. In just 3 minutes, the installation process can be finalized, resulting in a fully-functional page. This theme respects you by not wasting your time. In terms of loading speeds, your fullscreen site will be second to none. Users will get to enjoy a product that has earned a Page Speed grade of A98%. It should also be mentioned that the layout is entirely responsive. 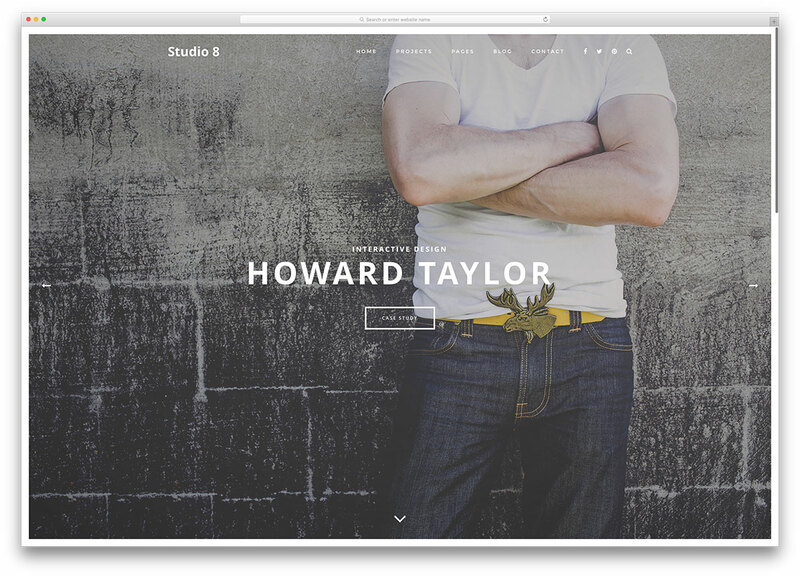 Be sure to access the Studio 8 live demo, for more information regarding this wonderful theme. 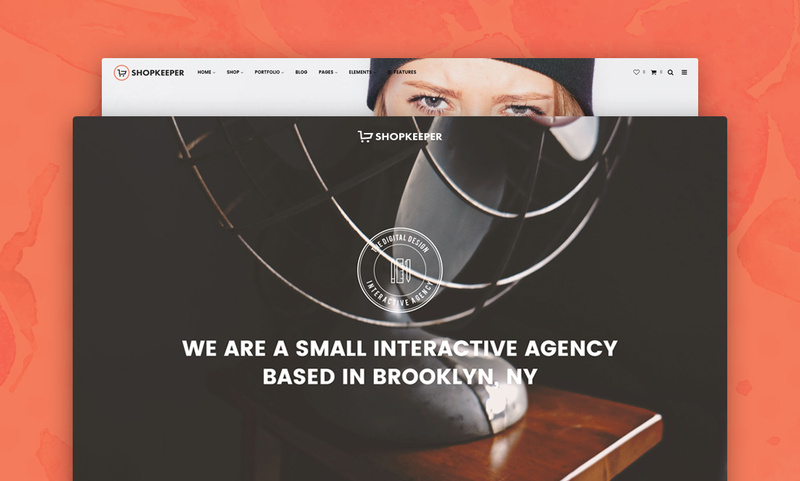 Shopkeeper is an elegant eCommerce ready theme developed by Get Bowtied. This theme is created for people who need a beautiful yet fully functional website for their business. It is highly responsive and looks pixel perfect when viewed on modern devices. The theme is loaded with amazing theme features and options that give you unlimited website design possibilities. 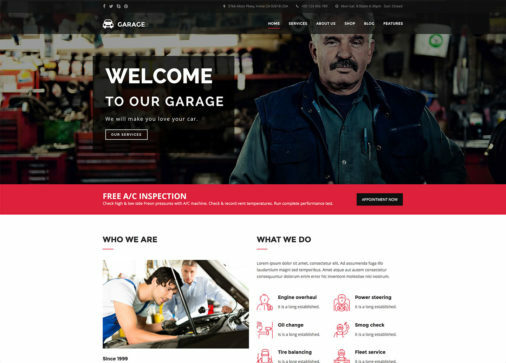 With the advanced features and functionalities integrated into this theme, you can now set up an outstanding website that goes well with your brand without touching a single line of code. The theme offers pre-built layout pages to help you choose the layout design that matches your needs. It is also fully integrated with Visual composer to help you create a brilliant website using the drag and drop functionality. You can customize its header to highlight your brand and showcase your products and services. It is bundled with Revolution Slider plugin to help you add attractive slides to display your content with fascinating effects and animations. This theme comes with masonry layout and includes interesting blog options that will surely encourage your visitors to take a look at your blog content. It also features a ready-to-go portfolio grid styles to help you set up a portfolio with ease. You change some of the theme design elements via its user-friendly options panel. 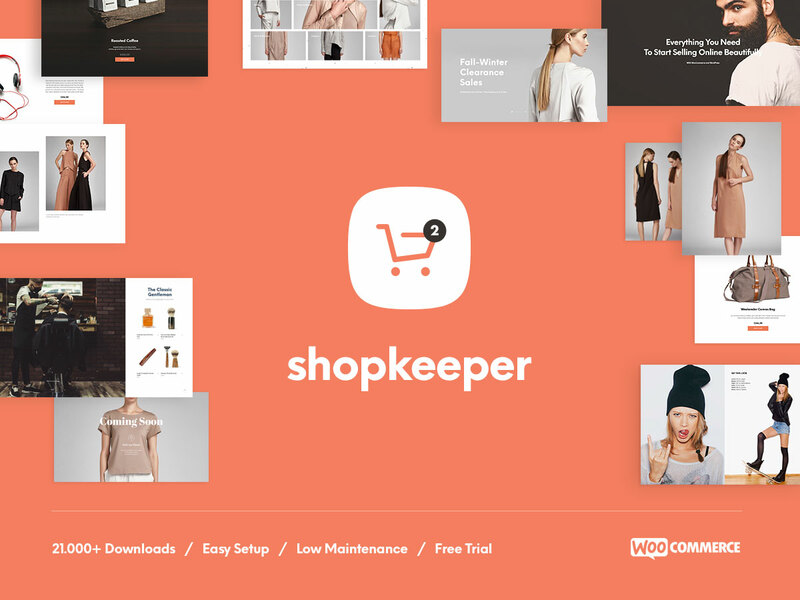 Shopkeeper is fully compatible with WooCommerce plugin to help you effortlessly sell shippable or digital products, collect payment and efficiently administer your inventory. 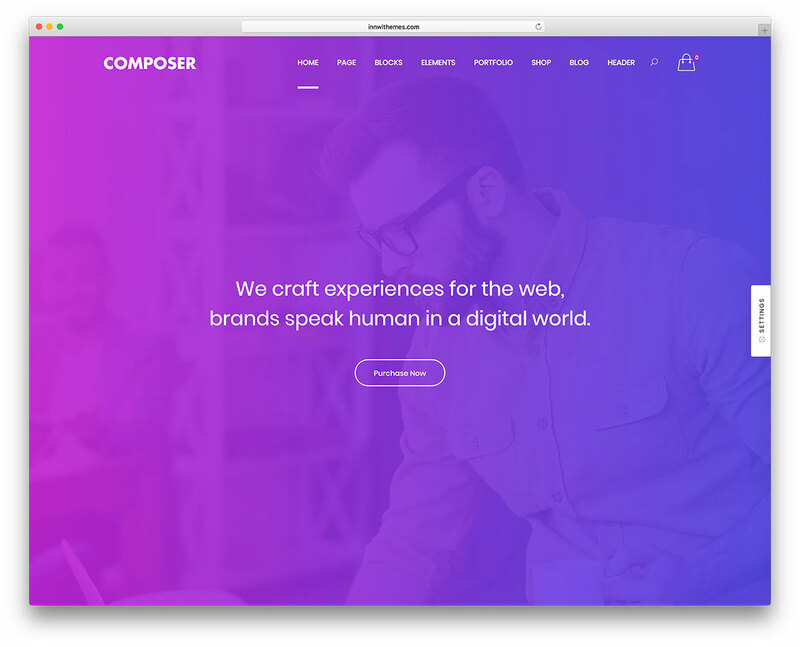 Composer is an adaptable and versatile real deal: the best-rated WordPress theme on Themeforest. With Composer, you have more than 75 demos tailored, to your needs! Take a ride with us to confirm its amazing adaptability to any kind of business. Composer adapts your gorgeous design to the screen size of your visitor’s device. It includes Retina-ready images and a responsive web design. It also includes high-resolution icons, MailChimp newsletter and premium typography. Composer offers more than 300 ready-made blocks and more than 200 layouts to create a site in minutes. Choose headers, backgrounds, and colors for your ideal site. Arrange all posts with Mega Menu support to create wide or normal sub-menus. Composer comes with copy and paste add-ons to help you easily edit elements between pages. It is integrated with premium plugins like Visual Composer, WooCommerce and Revolution Slider. An outstanding support team, whose main focus is client satisfaction, also comes with the package. On top of that, you can count on weekly free updates and a one-click installation process! If you are thinking on creating an e-business, come get Composer! Massive Dynamic is a bold and beautiful, elegant and eye-catching, dynamic and delightful, readily responsive WordPress creative multipurpose website builder. This theme is a solid, reliable foundation for the creation and development of modern, engaging websites across a huge spectrum of businesses and interests in general. Massive Dynamic achieves such flexibility by deploying the powerhouse real-time Live Website Builder, integrating premium plugins like Visual Composer, Master and Revolution Sliders and WooCommerce into a streamlined, custom set of layout editing tools, shortcodes and settings that can transform your website into whichever visual end-user experience you wish to provide your audience with. Multiple slick and attractive layout styles are available, including a hassle-free fullscreen style that matches several of the available, breath-taking template websites. Import these, and with a single click, their settings, animations, shortcodes and plugins are imported right along with them. Massive Dynamic’s gorgeous one page and multipage demos shine bright in fullscreen visual glory, as do its included high definition, Retina-ready collections of icons and fonts, numbered in the hundreds. Smooth AJAX visual features and effects are included with Massive Dynamic, for a completely enveloping end-user experience. If you’re going fullscreen, go with Massive Dynamic. You’ll see the whole picture. 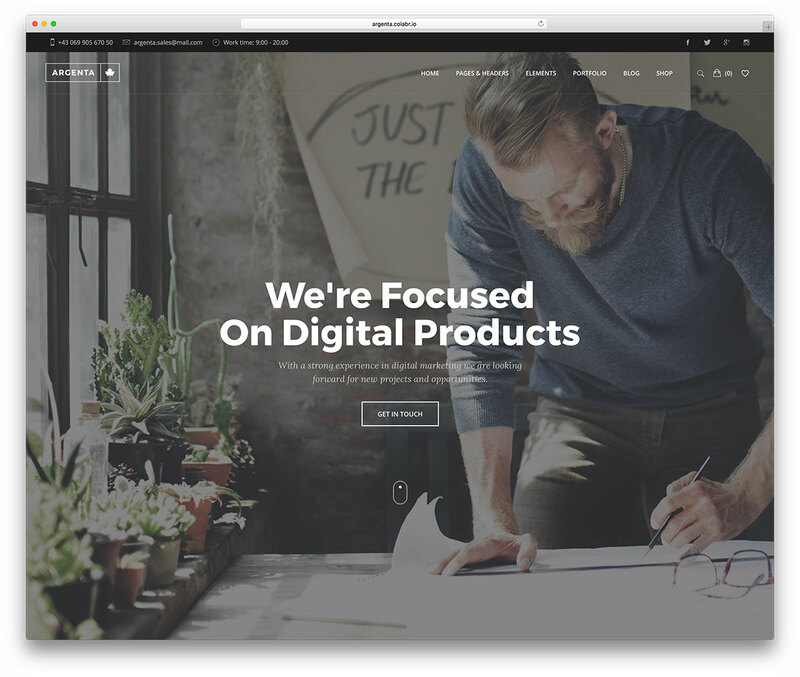 Purchasing X premium WordPress business theme for your website would be the best $60 you will ever spend. This professional and fully responsive theme includes numerous functional features that you can utilize in building a business website. X comes with only one of its kind built-in designs that are called stacks. Each of the stacks has distinct qualities and features, which can be modified via the WordPress Customizer. Moreover, it provides a drag and drop page builder that helps you set up a site in the twinkling of an eye. It comes with more than 600 Google fonts, 40+ shortcodes, clean code, slides revolution plugin, integrated with the social sharing feature, WooCommerce integration, etc. With these advanced theme features, you can surely take your business website to the next level! professionally polished website theme created specifically for handling all sorts of fullscreen websites that rely heavily on visual imagery as their content and their message. TwoFold has been equipped with the most powerful capabilities for managing photography content and making it shine under the most ideal spotlight. TwoFold includes impressive Light and Dark modalities that set the tone for different kinds of images, each with its own ample, generous set of diverse home page layouts, including KenBurns, Cube Effect, Slider with Thumbnails, and many more, Gorgeous, jaw-dropping Album and Gallery layouts with a series of amazing, deep customization options that let you turn their look and feel inside out at your leisure. Multiple grid styles and masonry styles are freely available for you to choose and fiddle about with. Fully customizable Collection pages provided with sophisticated filters for you to choose exactly which of your works to display. Any of these pages can be intuitively selected to function as your website’s home page, so your visitors get the user experience you want, every time. Try TwoFold! 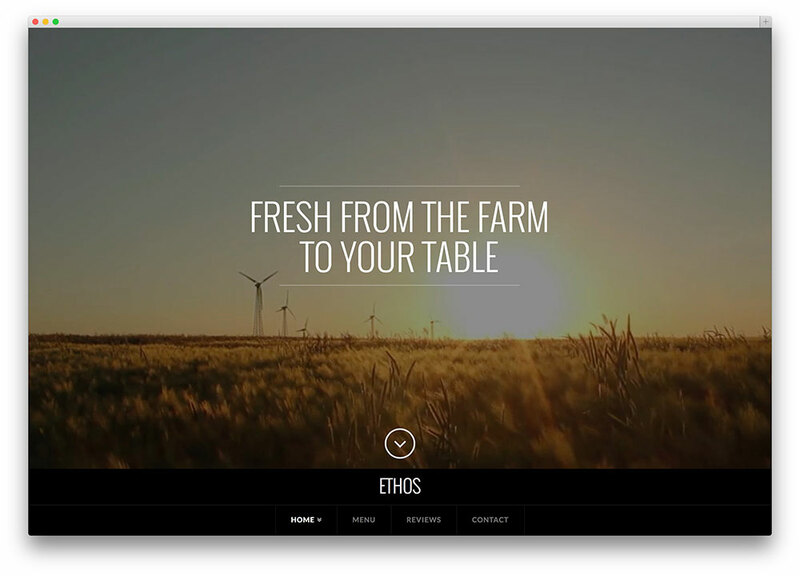 SOHO is an incredible WordPress theme that offers to improve your full screen website. Every customer will be able to showcase his/her video or photography artwork. Regardless of the purpose of your site, SOHO will look incredible. It is obvious that a lot of care went into the development of this theme. Only the best technologies were used, such as the advanced version of the GT3 page builder tool. In the online world, you can reward your page visitor’s loyalty by not wasting their time. With SOHO, the site will have lightning-fast loading speeds, resulting in an excellent browsing experience for everyone. With this theme, it is very easy to modify your content or site colors. Not only is personalization possible, it is encouraged. Both in art and in business, presentation is everything. Your pages can integrate video and image backgrounds, enhancing the overall aesthetic appeal of your site. In addition, an incredible full screen slider was added. This shines a spotlight on your work, increasing your odds of success. SOHO allows you to create an unlimited number of gallery albums, filled with various media. For more information regarding this full screen WordPress theme, be sure to read our full review. image slider and much more. This theme is so unique that it is nearly impossible to create 2 exact websites. Event the experts won’t tell that the same platform is used for these sites. Kallyas is a flexible premium quality WordPress of multiple purposes. It comes with many demos and homepages increasing every month! You will get theme made for greatness and ready for anything. Kallyas is Bootstrap based as framework and uses Visual Composer as page builder. It features a live customizer to make your experience outstanding. Experiment with both full-screen and boxed designs! Kallyas is retina ready, of high resolution and all screens-browsers adaptable! You will get to set up shops through WooCommerce and translate with WPML. Kallyas provides an easy panel with no coding required and +100 elements to customize. 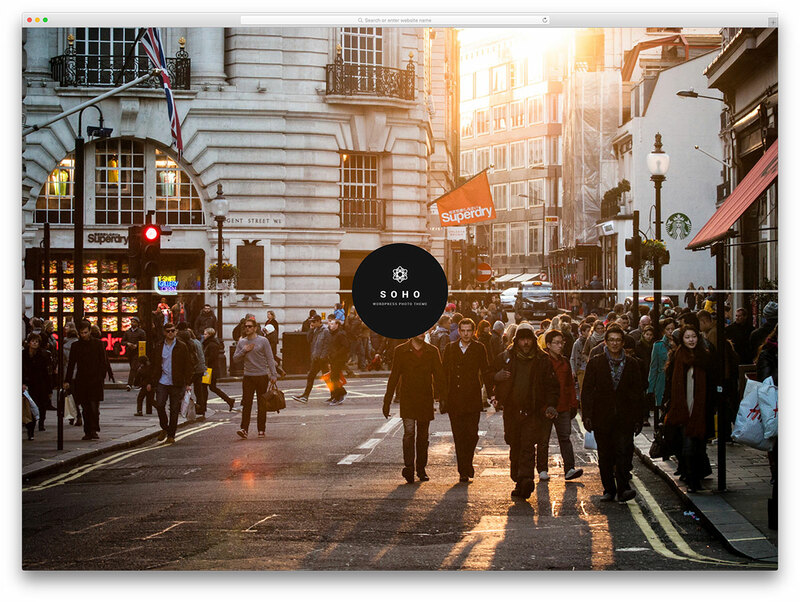 Use the power of its image display by setting portfolio layouts and slideshows. HTML5 and CSS3 animations and Parallax effects are featured too! 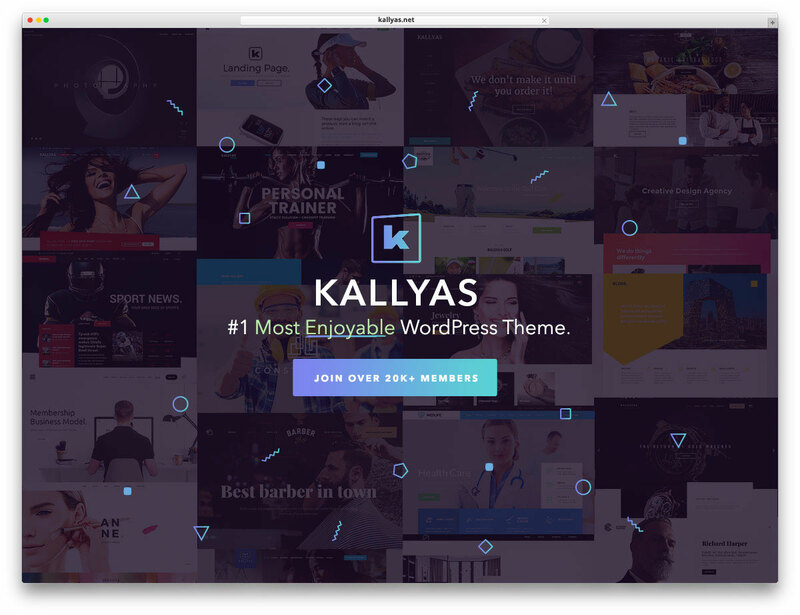 Kallyas is versatile, provides unlimited colors and features awesome custom headers. You will find the theme to be adapted to all screens and very easygoing. It uses SEO improvement to reach a new level of quality. Get quickly documented with video tutorials and written guides. Kallyas is product of Power Elite Author and a Hogash design. It aims for greatness in the multipurpose theme market and professional creative industry. Have fun and explore the perks of theme and its demos. Use Kallyas! 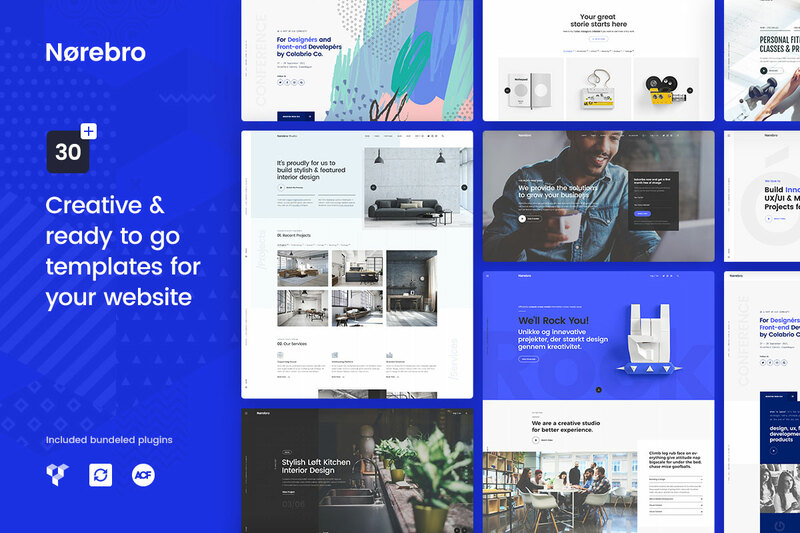 Norebro is a multipurpose WordPress theme that you can use for both personal and corporate business. 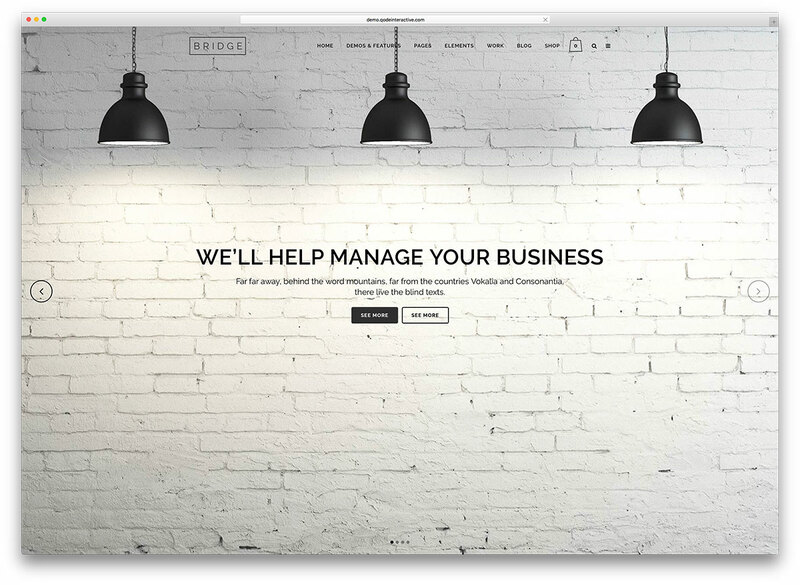 Choose from 30+ website concepts and get handy. Whether it is food, health, art or beauty, Norebro has special features for all. Thanks to the Visual Composer, your experience is kept fresh and easy. It allows tons of customization, without coding and with ACF Pro and 90+ shortcodes; you are good for set up. 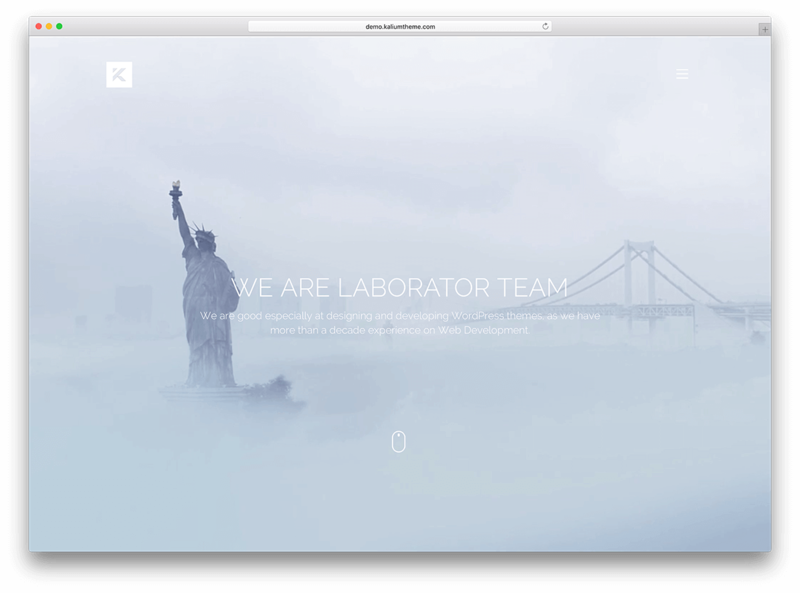 Norebro is 100% responsive and retina ready. Needless to say, graphics are amazing and can be viewed on any device. Website content is easily visible for search engines thanks to SEO. Enjoy the astonishing vistas that Slider Revolution and the multiple portfolio options offer. Parallax, premium typography and WPML are also included. Always stay up to date with the latest version and get a pleasant experience installing this theme. Professional and friendly are always available with Norebro! If you are looking for a simple one pages WordPress theme with full screen parallax sections then this is the right theme for you. It features a modern one-page setup that helps to increase user engagement. 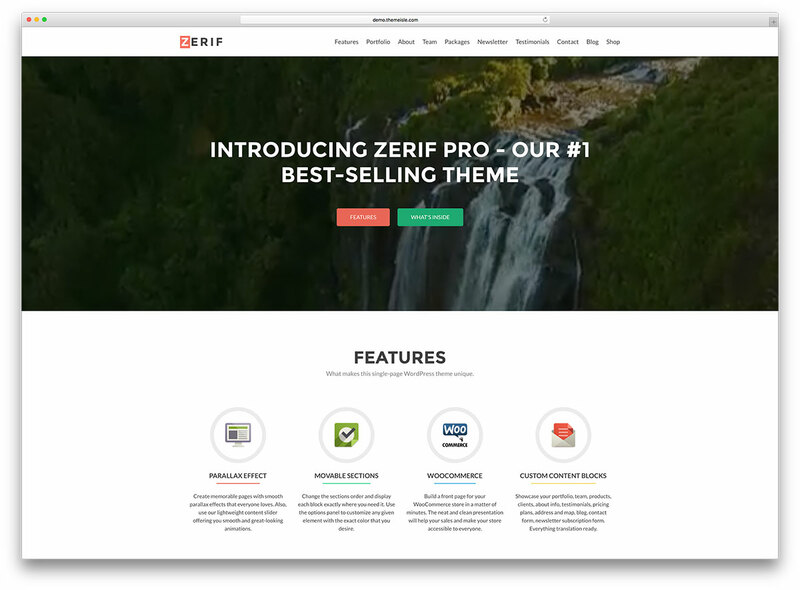 Zerif Pro theme is SEO friendly to make your website easy to find on Google and other search engines. This theme comes with several custom built widgets for easier management. Developers for this theme offer outstanding support that will guide you through setup and customizations. When purchasing this theme you can opt for full package and get access to all 20-premium WordPress themes. This would be valuable in case you own or manage multiple websites or are working as freelance developer and you need a great foundation to start with. 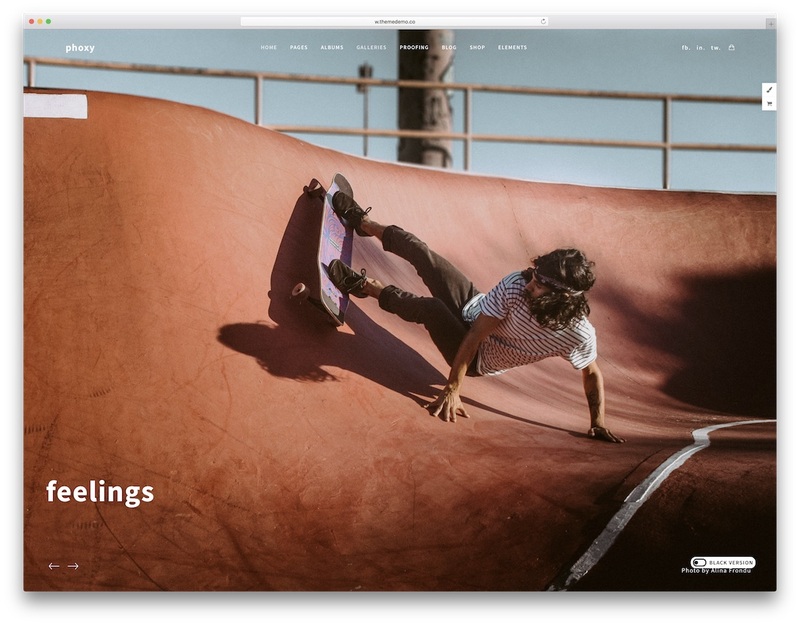 Inspiro a beautiful, visually stimulating, pliable and potent WordPress responsive photo-focused theme. 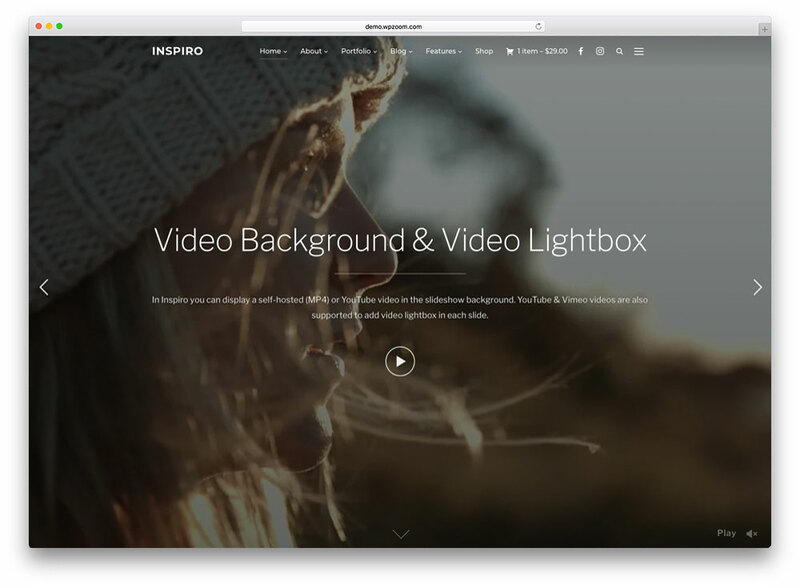 While Inspiro can gorgeously handle the needs of a wide range of websites, it is particularly powerful when used to create photojournalism websites. If you need to report very image heavy content in a speedy, fast loading manner to a wide, massive audience, Inspiro is the theme for you. Showcase your photography and heartwarming (or heart-wrecking!) posts for the world to appreciate with Inspiro. Powerful ZOOM Framework with its customized backgrounds, logos and much more. 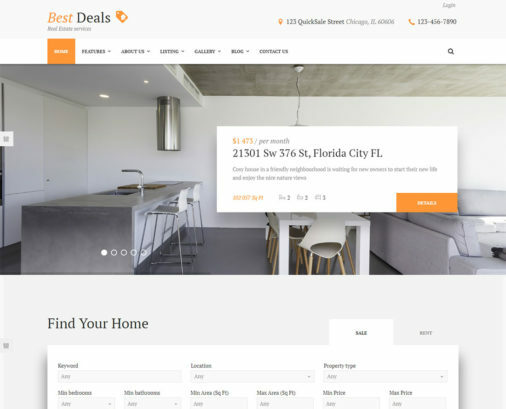 Dynamic Homepage Builder which affords extensive widget customization capabilities that will keep your readers engaged and will exhibit your best featured content in a spotlight that’s hard to miss. Captivate every pair of eyeballs that’s looking with extensive search engine optimization features, coded right into Inspiro. Total responsivity means every device will be able to enjoy your content with no compatibility issues existing. Illustrate today’s world, with Inspiro! Werkstatt is a modern and responsive WordPress creative portfolio website theme. This theme is a purposeful framework for crafting impressive websites with ease. It doesn’t matter if you don’t have any coding experience. With Werkstatt, all it takes is a few clicks to set up shop online. Use the Visual Composer to deploy hundreds of elements by dragging and dropping. Customize endless settings in a matter of minutes and shape your pages to your liking. Branding has never been easier than with Werkstatt. And with powerful SEO capabilities, getting your website out there is effortless and speedy. Businesses and bloggers alike love working with Werkstatt. So many powerful layouts are waiting under the hood; the possibilities are endless. 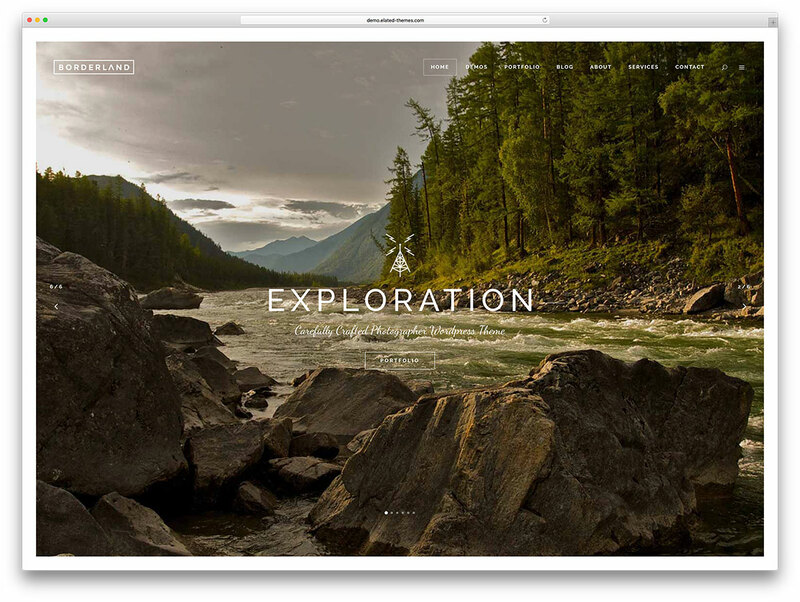 Werkstatt is a handsome and tech-savvy solution for fullscreen websites as well. With creative layouts for fullscreen applications and fullscreen portfolio pages, you’ll dazzle your audience. Cutting edge HTML5 coding ensures your website has a robust handling of multimedia. Deploy fullscreen self-hosted video content within a couple of clicks with Werkstatt. Completely responsive, Werkstatt can adapt your website to any platform without any coding whatsoever. Reach users on every device, operating system and browser out there. With Werkstatt on your side, the sky is the limit! 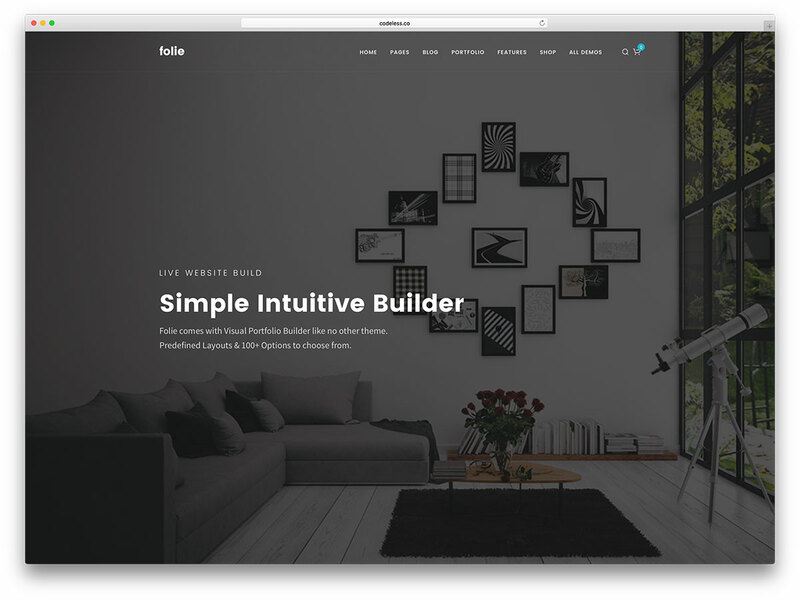 Folie is a WordPress theme with incredible versatility and simplicity made for everyone. It provides several demos and templates to get started quickly. It uses Visual Composer as page builder and is customizable in real time. Folie has a malleable design adaptable to boxed or fullwidth formats. It supports all browsers and it is mobile friendly as well. You get to make customizations with a clean code and many shortcodes to fasten processes. Folie is improved with SEO plugin and tons of pre-designed elements. It features the awesome Layer Slider and Slider revolution to set up showcases. Galleries can also be uploaded and even helped with Lightbox. Folie features unlimited colors and sidebars as well as a powerful menu. Headers and footers are fun to play with and useful to set widget areas and search bars. Backgrounds are fully customizable with videos, animations and Parallax effect. Folie is WooCommerce compatible making transactions and product selling and integrated possibility. Posts are customizable through several font sets and immediate translation of WPML. You will have unlimited portfolio, blogs styles and pages to post. Folie uses Bootstrap framework and provides cross-browser compatibility. Try out this vastly documented and strong theme! Relax and enjoy testing Folie! 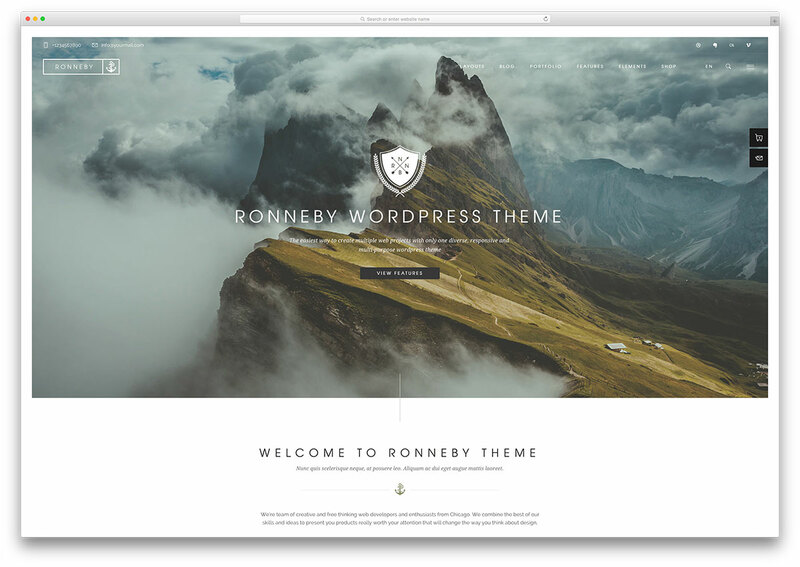 Ronneby is a revolutionary WordPress theme that specializes in exceeding expectations. Additionally, it comes as no surprise that it is considered the top WordPress newcomer theme of this year. With this product, your full screen website will look incredible, and it will be extremely user-friendly. Ronneby is sharp and powerful, with a layout that is completely responsive. Content can be accessed from tablets, smartphones, desktop PCs, and laptops. In addition, the theme is cross-browser compatible. Say goodbye to compatibility errors! For novice users, the website creation process can be a little intimidating. Thankfully, Ronneby does it best to facilitate your experience. It has incorporated a comprehensive documentation source that offers to explain every feature in detail. You can easily become an overnight expert. With a grand total of 40 layouts, lack of choice will never be an issue. It should also be mentioned that new demos will be included each week. This product is a constantly-expanding masterpiece. It incorporates a charming portfolio and blog, and they are fully-customizable. There are 13 templates of blog pages, and 42 templates for portfolio pages. It should also be mentioned that every client can save $68, given that Ronneby has added the Slider Revolution, Visual Composer and Ultimate addons for VC, free of charge. For your top-quality full screen website, Borderland is an ideal choice. It has a charming, user-friendly interface and a series of practical features. With this product, you will be able to design a page that perfectly matches your vision. Creating a full screen site from scratch can really affect your schedule, especially if you are busy running a business. Thankfully, Borderland has 12 amazing demos, and each demo can hasten the web development process. You don’t need any advanced programming knowledge and you don’t need to hire a professional company. From start to finish, you can finalize the creation of a fully-functional page in a matter of minutes. You can also integrate Ajax effects with every page transition. Regardless of your business niche, it can be productive to sell merchandise via the web. Borderland has integrated one of the most prolific plugins on WordPress: WooCommerce. It allows you to design an incredible online store that can attract many customers. If you are in need in information, you can always access the extensive theme documentation source. It is very helpful, as it offers to guide you through the site customization process. In addition, it is possible to contact the amazing support team. Their representatives are well-trained and very polite. Few WordPress products can ever hope to match the quality of Photo Me. 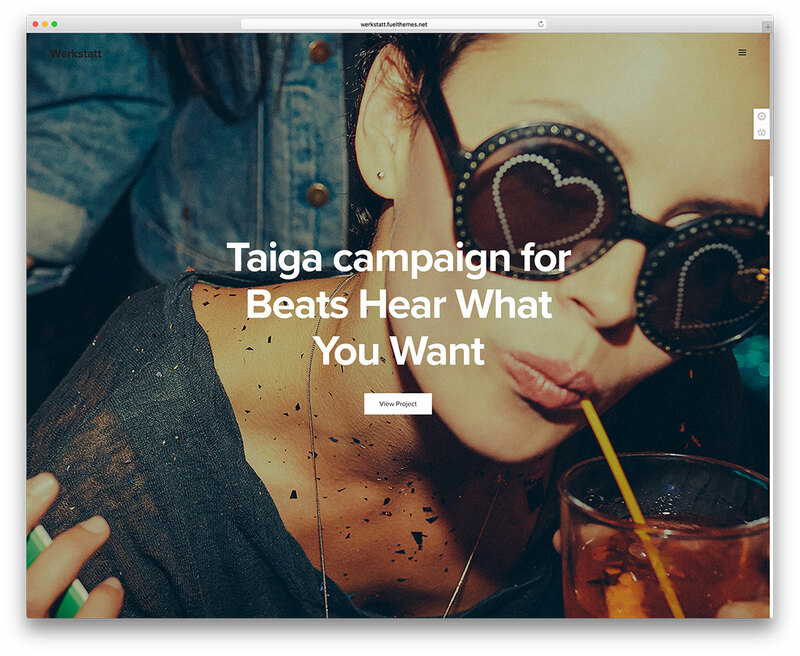 This full screen theme is loved by over 95,000 people, and more customers are joining them each day. Photo Me allows for an explosion of creativity, as each user can create a page that perfectly matches his/her vision. There are many demos, so lack of choice will never be an issue. Currently, customers will gain access to 8 demo variations and more than 50 portfolio and gallery templates. You can also import these variations with just a single click. Moreover, it is possible to showcase photography and other content elements in gorgeous full screen gallery layouts. By accessing the Live Customizer tool, customers will be able to personalize their pages in real time, as they receive instant feedback. Feel free to alter the background, color, or typography. Furthermore, Photo Me’s layout is compatible with hand-held devices, and it has completely eliminated resizing errors. Site visitors can view content from their desktop PCs, tablets, smartphones and laptops. In addition, the theme is also cross-browser compatible. Even your gorgeous site can fail, if people are not aware of its existence. Everything depends on search engines, and Photo Me is SEO-ready. Your view count will surely increase. 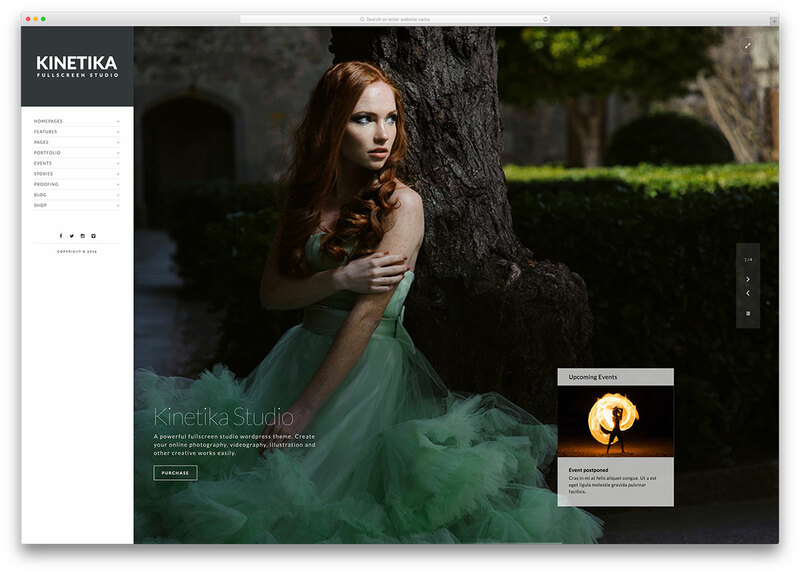 Kinetika is a versatile, streamlined WordPress theme that caters to full screen websites. It incorporates many incredible features, each promising to expand your page’s capabilities. Your site will integrate event posts, multiple portfolio showcase functions, and photo proofing galleries. Of course, you will be able to distribute your merchandise online. In order to facilitate those transactions, the developers integrated the theme with the incredible WooCommerce plugin. It allows for the creation of professional online stores. This will certainly increase your bottom line. With Kinetika, you can showcase your content on high-resolution Retina displays and most web browsers. In addition, the layout is completely responsive. Regardless of the viewer’s screen size, the page elements will be impressive. They also eliminated all of the compatibility errors. Your chances of success are directly proportional to the size of your audience. You can expand your target demographic, by translating your page. They made it possible by including the WPML multilingual plugin. Your international fans will certainly appreciate the extra effort. Kinetika has translucent menus and vertical menus. You will also gain access to a light or dark color scheme variation. It is also possible to create awesome full screen slides, via the Slider Revolution plugin. For more information regarding this excellent WordPress theme, be sure to access the live preview. 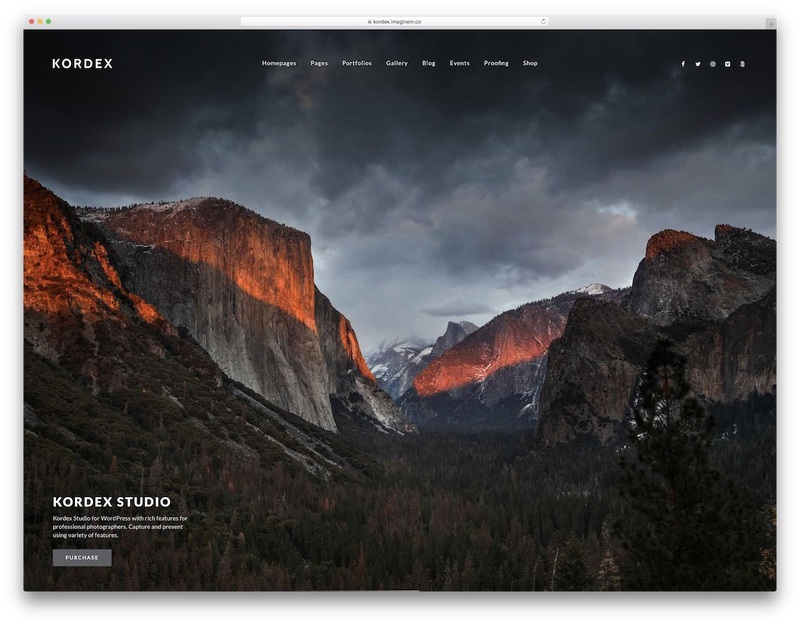 To create a strong impact on your audience and win over more potential clients, Kordex is the full-screen WordPress theme for every photographer out there. You need to invest little work and time on your end to create an online portfolio that will push your works and services to the global audience. With a full-screen slider, you can impress your guests and quickly introduce them to the world of your masterpieces. Other traits of Kordex are drag and drop website builder, blog, multiple gallery layouts, predesigned widgets and photo proofing. There is a light and dark demo which helps you to decide on your web presence in a snap of a finger. But you can do any other improvement and edit you want with the integrated Elemento editor. Do not miss the opportunity and make a difference in the photo business with Kordex. Just like your photo project knows no limits nor does Phoxy. 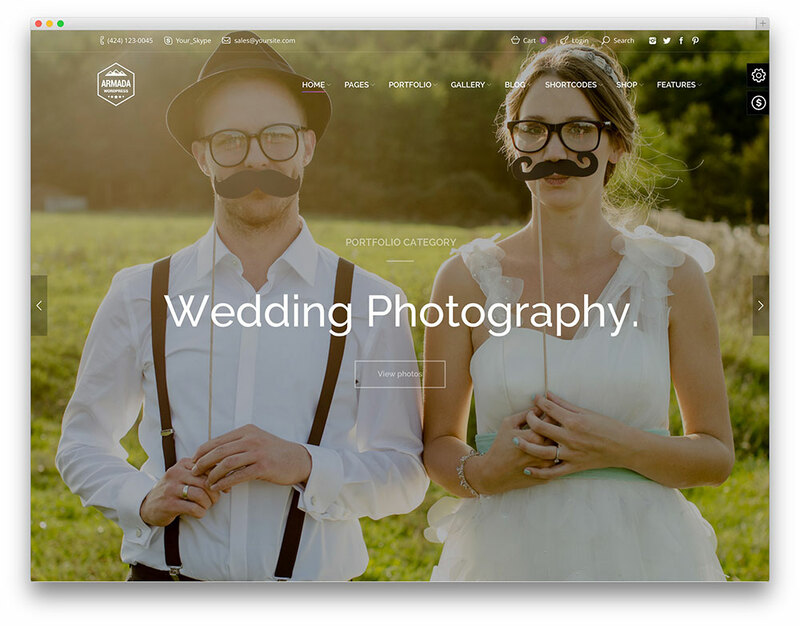 This full-screen WordPress theme is a powerful tool for amateur and professional photographers who are ready to get their projects to new degrees. With a whopping collection of 38 demos, forty albums and galleries and ninety ready-made blocks, the options you have with Phoxy are endless. Besides, you can also incorporate your signature style to the web design and customize Phoxy to suit your taste best. With Phoxy, you can also implement content marketing and expand your online portfolio with an eCommerce section. Drive in more traffic and start selling your works and merchandise. Whatever you do with Phoxy, it is a guarantee that the end product will be a real gem that will wow and impress everyone visiting it. Argenta is a multipurpose WordPress theme with lots of specialized demos. Additionally, it has a very responsive design with premade layouts and a one click install format. One of its best features is its fullscreen option. This is possible thanks to its use of SEO for the search toolbar and its pop out windows. Also, the developers creatively thought of the Headers and Menus for fullscreen. Clients can be happy with image display. Moreover, Argenta works as a high performance theme with high resolution and customizable backgrounds. It uses Visual Composer and Masonry grid layout for some of its features. Furthermore, all demos come with blogs layout settings, online stores and showcase project pages. Additionally, Argenta has flexible panels, footers and sidebars. It is very easy to customize. This makes fullscreen mode a lot more comfortable. Argenta comes with an integrated translator (Po.Mo) and it is also compatible with WPML. For its payment/shopping service you have WooCommerce and AJAX plugin. One of the best things this theme has to work on all kinds of screens is its Slider Revolution plugin. Lastly, they updated Argenta to the latest WordPress software. You can take a look at Argenta and all its modern up to date features so you can convince yourself. Overall, it will be the best choice that you won’t regret! Vigor is a versatile and accessible WordPress theme that promises to improve your full screen website. It also has a user-friendly admin interface, and a charming design that can impress even the most cynical customers. Vigor offers a large roster of incredible features, allowing the user to craft a page that perfectly matches his/her vision. There are multiple full screen header layout versions, and a specific Slide Area. You can position your headers either at the top, or the side of the page. The template has integrated an Edge Slider with video and image support, complete with Parallax functionality. You can also zoom animations for every element that you showcase with the slider. Vigor has a modern, fully-customizable Mega Menu. Every section can feature video backgrounds, and there is a spilt screen slider layout. Your followers can rest easy knowing that they will never experience resizing errors, given that this product is entirely responsive and cross-browser compatible. Moreover, they can enjoy every post from their smartphones, tablets, or desktop computers. In addition, screen elements will look amazing on high-resolution Retina displays. The developers also included a child theme, along with custom widgets areas. In order to sample Vigor, be sure to access the live preview. Developed by an elite author, Unicon is an exemplary WordPress theme that was made for full screen websites. It also has a large number of innovative features, and a charming layout that can impress even the most cynical customers. Version 2 of Unicon is now live, and it offers new layout options for your pages, advanced image settings, modern mouse-swipe sliders, new form styles and animated elements. In addition, there are 2 icon sets with more than 300 icons. If you choose to buy this product, your view count will certainly increase. Also, visitors will always appreciate its quality and attention to detail. Unicon has a tool for almost any occasion. If you decide to use it on your site, you will also save money. Moreover, the author integrated The All-In-One Package and it includes the premium Visual Composer plugin. Furthermore, you can enjoy this plugin free of charge so you can facilitate the site creation process. In addition, your pages will benefit from the Revolution Slider, and WooCommerce plugins. It would also be a waste of potential for a popular site to ignore the eCommerce market. Thankfully, you will be able to design efficient and professional online stores. Lastly, you don’t need any type of programming knowledge to use this theme. If you wish to sample Unicon, the author added a live preview. 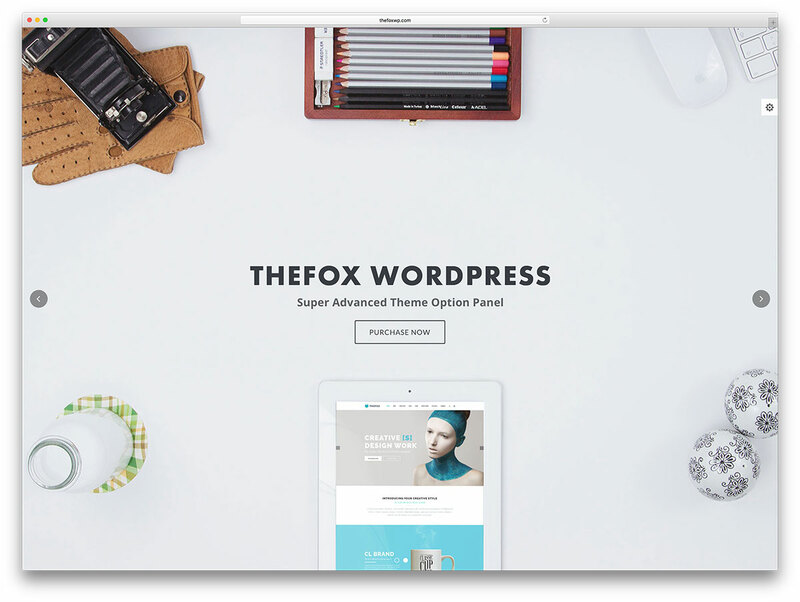 TheFox is an ideal choice for users who want to create excellent full screen websites. Its large collection of features allows this product to accommodate almost any business, regardless of its niche. Additionally, it is very user-friendly, offering to guide new users through the web development process. Also, the creators made it possible by including a comprehensive documentation source. Moreover, you will easily become an overnight expert. Should any errors occur, do not hesitate to access the support forum. For those who prefer a more visual medium, the template comes equipped with several video tutorials. In total, TheFox has 30 professional home page designs. This pre-made content is not only beautiful, but it can also spare you from having to start from scratch. With more than 250 design details, you will be able to craft a page that perfectly matches your vision. They also made customization possible by integrating intuitive options panel, which gives you access to every setting and parameter. In addition, all posts and pages will have their own options panel, making them easier to personalize. You can save a total of $120 by purchasing TheFox. This template incorporates some incredible premium WordPress plugins, such as the premium Slider or Visual Composer. 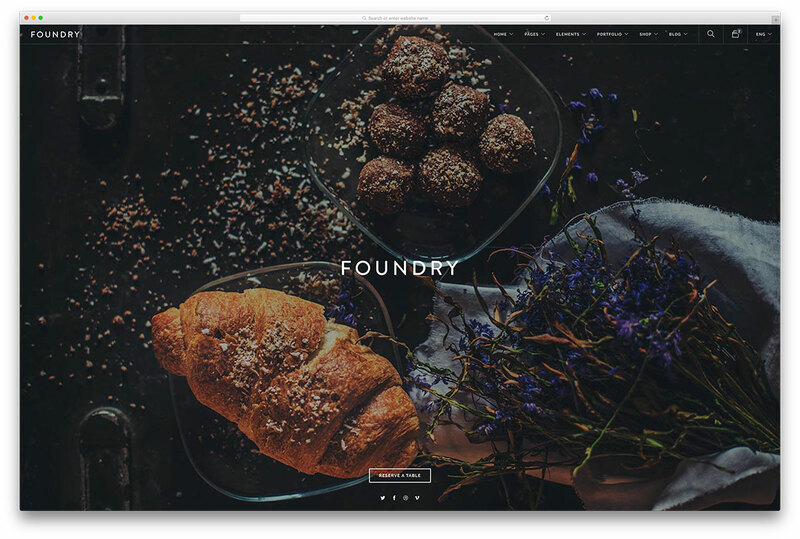 Foundry is a responsive and flat theme for any full screen WordPress websites. Additionally, the developers created its design professionally, making it a perfect fit for blog, portfolio, business, or marketing pages. They also made Full Screen site customization easier by including the popular Visual Composer plugin. In addition, there is a large number of custom page builder elements. This turns your page into a fresh lump of clay, which you can readily mold to your will. In terms of color customization, the possibilities are virtually endless. Feel free to experiment with different variations, until the result matches your vision. Considering that your visitors will spend their time looking at your writing, your site needs to have a beautiful typography. Thankfully, Foundry offers hundreds of gorgeous Google fonts. Moreover, they constructed the template using the prolific Bootstrap framework, and made it entirely responsive. You can now showcased your content on the screens of desktop, and hand-held devices. Also, they made Foundry cross-browser compatible for your convenience. You will certainly fall in love with this product since it has a well-structured LESS and CSS. For your home page, there are more than 20 pre-designed concepts. Lastly, you can save a lot of time by choosing one of these designs. Armada is a modern and innovative WordPress theme fully equipped with the best features and plugins necessary in developing a smart and fast loading website. It’s extremely responsive and adjusts impeccably on any device because it’s retina ready. Armada also offers oodles of design and styling options that helps you build a dazzling website. From big time creative agencies to personal blogs, Amada will give you an awesome website template for your next project. This theme includes 16 ready-made skins, multiple header, page title & content interposition options to help you achieve your dream website. It also offers tons of unique layout elements so you can build and organize your page. You can show your content to your audience using 4 different slideshows, masonry (justified grid and list portfolios and galleries) and responsive magnific popup lightbox. Armada also comes with dedicated post types for portfolio, testimonials, galleries, and others. Armada allows you to create an unlimited number of widget areas and display them individually in sidebar(s) and footer on pages, posts, etc. Additionally, this theme comes with unlimited widgetized areas, custom widgets, innovative page template system and supports multiple post formats. Armada contains $75 worth of useful premium plugins. The developers integrated it with Visual Composer so you can create unlimited pages instantly. It contains two of the most popular slide displaying solution so you can produce transitions, effects and custom animations. It includes Go – Pricing table plugin and WooCommerce so you can sell your products easily. They optimized Armada for speed so it can yield good scores in GTMetrix and Pingdom tests. They created Armada with SEO best practices and made it compatible with SEO by Yoast and All in One SEO Pack plugins. 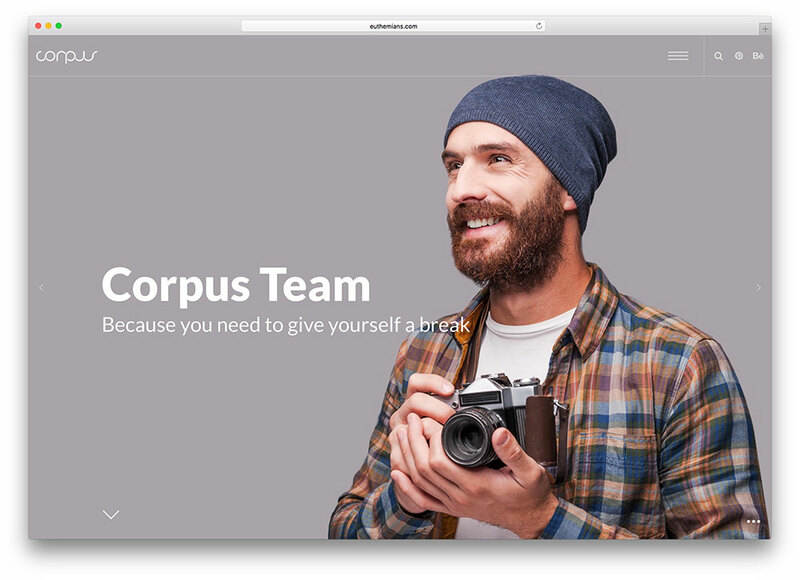 Corpus is an incredibly modern, astonishingly fast-loading, dynamic and vibrant WordPress responsive multipurpose theme, designed with the philosophical imperative of visual prowess. Also, it’s a theme suitable for a great diversity of webmasters, from private individuals to freelance professionals to businesses and corporations big and small—but sharing the common desire for creating pages that are stunning to behold and create indelible memories in the eyes and minds of their intended audiences. If you’re here to make a statement and want no one to be capable of diverting their attention, Corpus is the right theme for you and your website. Moreover, Corpus includes many incredibly powerful features, such as WPBakery’s Visual Composer and the Redux framework, as well as incredibly customizable power over the visual aspect of your website—full width blog pages, full width portfolios, full width background sections and elements—it’s a full screen, touch-friendly, mobile-friendly brave new world, and Corpus is just the theme to navigate you through it, with its powerful HTML5, CSS3 and LESS technologies powering gorgeous Parallax backgrounds and scrolling smoother than digital silk. Animated and lively, Corpus is also Retina ready and search engine optimized, as well as natively crossbrowser compatible. Furthermore, single page and multiple page options are readily available. See the big picture with Corpus! Tower is a fully responsive, Retina-ready theme for WordPress sites. It offers an incredible degree of diversity and versatility, given that this product is capable of adapting to any site niche. In terms of customization, lack of choice will never be an issue. 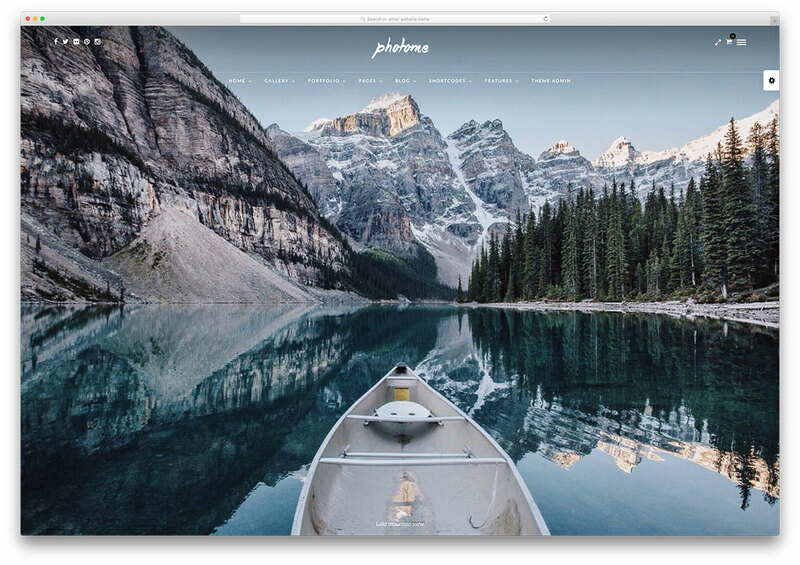 There are over 30 distinct layouts for your portfolio, in addition to a personalized Codeless Slider. This incredible theme will also allow you to showcase your best posts and pictures. There is no better way to impress your followers. Moreover, the developers spent a lot of research into the development of Tower to improve your odds of success with every single feature of the theme. Site owners can also increase their profit margin and raise brand awareness by opening their own online store. This task is quite easy, thanks to the implementation of WooCommerce. This is also one of the most trusted plugins on WordPress, as it facilitates the creation of gorgeous site shops. Moreover, one-click demo data is available as well, offering to speed up the page setup process. 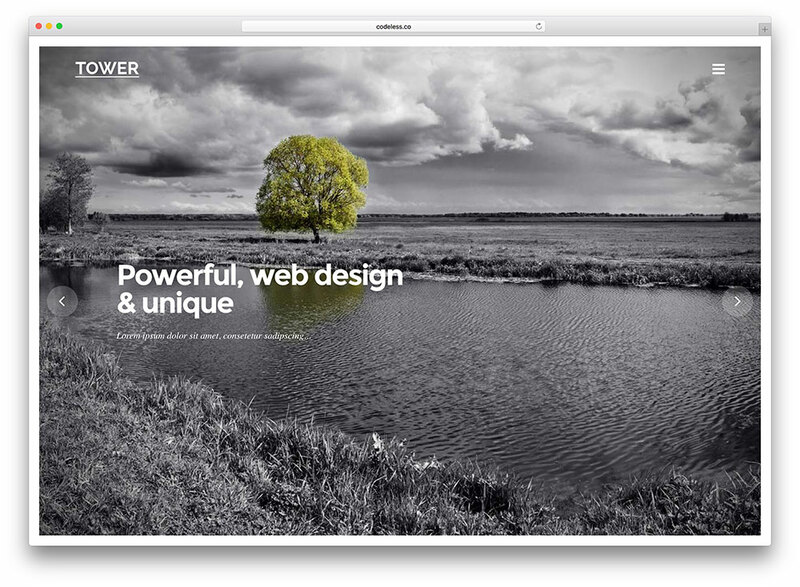 Tower has included stunning Video Backgrounds, and a modern Drag and Drop Page Builder. lastly, if you wish to sample this theme without having to spend any money, they added a live preview of the theme. Bodega is an excellent WordPress theme that can improve every element of your full screen website. Additionally, if you are a business-oriented person who likes to focus on class and professionalism, this product can be your greatest ally. In total, Bodega has 30 amazing demos, and each demo can drastically increase your chances of success. Your full screen pages will feature groundbreaking features: Border Drawing Animations, SVG graphics and Line Drawing Animations, Clipping Mask Animations and Animations Controlled by scroll. No other site will be able to match the charm of Bodega. 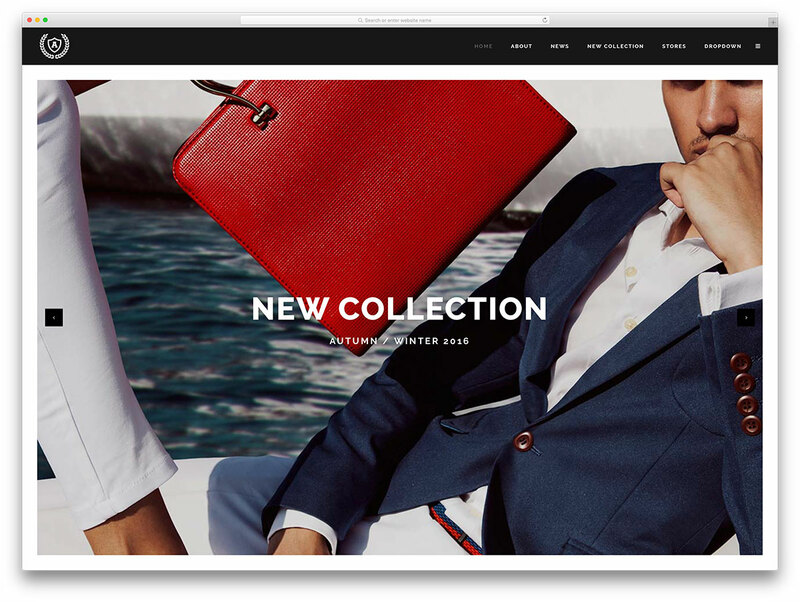 Customers are also able to construct beautiful frames for their sites, via the PASSEPARTOUT feature. There are limitless feature combinations, so feel free to experiment. Moreover, this template has multiple portfolio hovers, and it is very easy to customize. Even novice users can design a successful page, thanks to the inclusion of the Drag and Drop Page builder. Furthermore, you only need to select an element, and drag it across the screen to where it needs to be. It’s that easy! Lastly, Bodega users will benefit from 6 header style variations, and 4 distinct icon sets. It is possible to increase your revenue via online commerce, due to the inclusion of the prolific WooCommerce plugin. 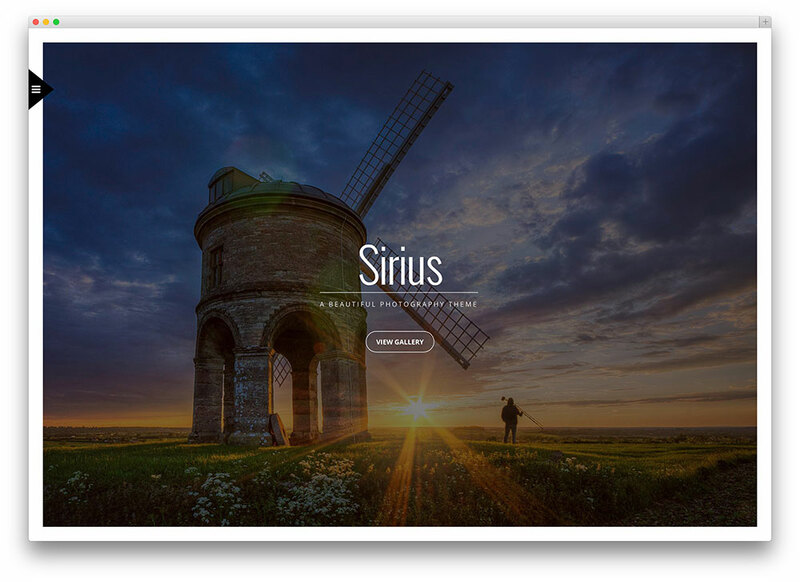 Sirius is a clean and bold portfolio photography theme well suited for all kind of portfolio and image centric websites. It also features AJAX galleries that makes your images load on the fly without refreshing the entire website. Also, AJAX makes your website to look much more professional and makes it slightly faster. Sirius has several layout options such as Masonry, full screen, grid, columns and you can fit all of them for photographs. 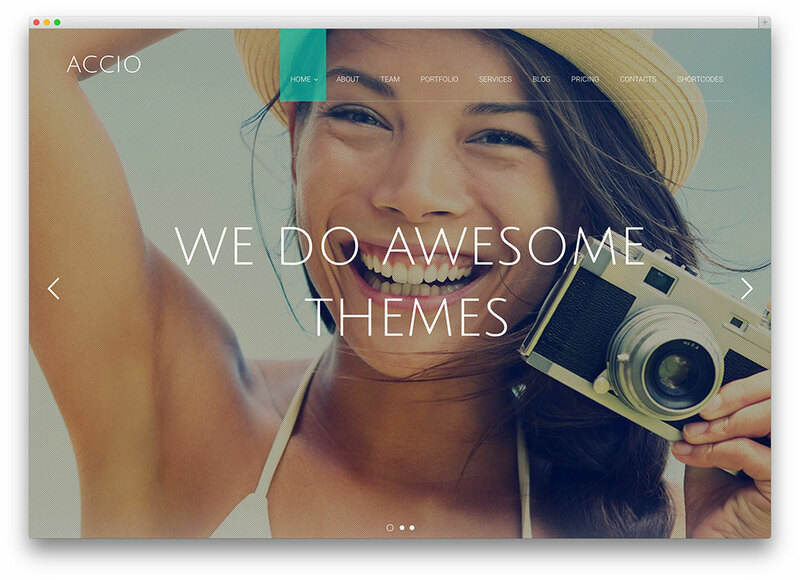 Accio is a top-notch premium one-page WordPress theme with a built in parallax scrolling effects, full screen image and video slider and advanced navigation options. Additionally, this theme is developed using Bootstrap which makes it mobile-first and well optimized for other devices as well. The creators gave Accio a unique pixel perfect design and well-crafted functionality that is different with anything else in the market. I am not a huge fan of this kind of WordPress themes and web design in general. Then thing is that this kind of themes look awesome on tablets, smartphones and laptops with low resolution screens. Of course these are the majority of users who are going to view your website but if you are using something like 27-inch iMac or some other 4k monitor then you will be looking at a huge distorted images or even worse, images will have lank spaces on the sides. Both these things can be addressed for high resolution displays but in most cases webmasters doesn’t do that and they don’t even notice because they are happy that it looks nice on their low resolution MacBook Air. Even some theme designers doesn’t take this into consideration and forget that users might have higher resolution monitors. If you take this into consideration when creating themes and websites then its awesome and I hope that more webmasters and theme designers will do so. I am not a huge fan of this kind of themes either but you will be surprised how popular is this theme collection. It is definitely on our top 10 and it means that there is a demand for this kind of themes. You also mentioned that these themes looks great on mobile, tablets and low resolution laptops and since these users accounts for 95% of the entire web traffic I guess there is a reason why these full screen themes are so popular. 4k or even 5k monitors are not yet standard and even Full HD didn’t get picked up and was immediately replaced by laptops. I can assure that these themes are here to stay and no one will care about users with large screen high resolution displays because no one will use them except designers, photographs, developers and some other heavy computer users but that’s about it. Wow you sound like such a douche. No one has a high res computer these days, 75% of all views are on small screens. Small size screens are also high resolution. For smaller screens pixel density usually is much higher because you are viewing them much closer to your eyes. These days standard resolution for 24-inch monitors are 1920×1080 and most smartphones with 5-inch screen also have the same resolution even tho they are much smaller in size. Thank you for this amazing theme collection! I am wondering if I there is any disadvantage if I choose to go with flat design theme such as Wynn, Reload and Bridge? By that I mean if flat design is here to stay or it will be soon replaced with something even more awesome and my website will look outdated? We already made a mistake by creating long shadow logo for our business and I already see that we made a wrong decision as more and more logos are made flat than based on long shadows. Thank you in advance! I might be biased towards flat design WordPress themes as most of my themes I have designed and developed recently uses flat design. The thing with flat design is that it feels timeless because it is clean, minimal and puts your content first. I believe that it is here to stay probably with some modifications such as ones introduced in Google Material Design. It is a flat design but it has effect that makes it look layered and you can see what element is on top and in front. However, these are minor changes and it is still a flat design. Keep in mind that not all flat design examples are good because it is even easier to design it poorly because devil is in the detail and in flat design details are what counts the most. The same applies to long shadow design you mentioned in your comment. You can make it look awesome and timeless but there is a huge chance that designer already made it horrible looking when he was working on it. Nice Share Admin!! i Magxp theme very much, sharing is caring indeed. mind if share too? just a link here..
Aigars, this is a remarkably good list of the latest WordPress themes – great pics! I actually saved the link – love this. This is awesome list, I like it very much. Thanks alot. I’ve been searching for quality full screen wordpress themes for months. This one page solved all my issues. Thanks. Bookmarked! Thanks, great work. I am also experimenting with Sydney, Arcade and TESSERACT. Thanks again. Will check some of these out. I do have a question…will these larger pictures slow down my page load? It depends on many factors. It might or might not slow down your website. 1. High resolution images are not always large in size if they are well optimized. If you can keep individual image size under 150kb you are going to be fine. if your images are something like 1MB or more in size then your website will load slow especially on mobile. 2. It is better to serve images via CDN such as MaxCDN. We use it for our website and it is blazing fast to load and helps us to serve millions of images each day. 3. If you are using a cheap shared hosting from Hostgator, Godaddy, iPage or others then your website will load slow even when there are no images present. Their infrastructure are not optimized for WordPress therefore it will load fast. To make your website at least 5x times faster even when large images are present you should check our hosting guide. 4. A proper object caching. WordPress is slow by default and that’s why having object caching is crucial to serve large images. In case you are using cheap shared hosting you will have to implement your own solution which is not going to be very fast but still better than nothing. If you are going to follow our hosting recommendation then object caching will be handled by hosting provider making your website much faster and more reliable. If you have any questions about WordPress hosting or WordPress performance, please let me know and I will be happy to help. Are all these themes Responsive – i.e. mobile devices?? All above listed themes are responsive and mobile friendly. This list is regularly updated to include the latest and greatest WordPress themes as well as we remove ones that feels outdated or are no longer supported. Therefore you can always find the best themes that are currently available that packs the latest and greatest features. I see that you choose SEO WP, which is a great WordPress theme for SEO service providers, digital agencies, social media agencies and other small businesses. I have a fullscreen phototraphy website but have been thinking about SEO lately. Adding text to the homepage helps SEO but what if you’re using a Fullscreen homepage? They have great impact visually but would you recommend them and how can they be improved for SEO? Is the visual impact worth the ‘loss’ in SEO? If you are thinking about ranking your main page on Google for some competitive keywords then it is nearly impossible to do so without having many backlinks (much more than your main competitors have) or good content. However, it is not all that bad and you can still get SEO traffic but in that case you should concentrate your link building and content strategy to inner pages. These can be blog pages, service page, gallery or any other page. You won’t get traffic as much traffic directly to main page of your website but you can drive visitors there. Once visitors are on your website you can do whatever you want with them. Just mention that they should visit your website’s home page within article or highlight it inside menu or try other things. Writing a good content and getting links for your website’s inner pages will also improve your overall website SEO and therefore will increase your chances to rank your homepage as well even tho there won’t be any content. For Colorlib we have similar situation and very few visitors goes to homepage directly from Google. Our homepage isn’t that important therefore we don’t even try to send visitors there and we still get an incredible results. Let me know if you have any other question about SEO, WordPress themes or WordPress in general. There is no doubt that You have shared responsive and mobile friendly wordpress Theme for blog, Corporate, Portfolio and Photography Websites. I have also worked on blogging but I didn’t find good results. One thing that really helped me to promote my product and services to achieve my marketing goal is Explainer Video. I’ve been reading your articles about thoses theme for a few days and though I love having your opinion I still can’t make my mind on a specific photographic theme. One question though I can’t find the answer, I need a private gallery section for my clients, do you know if any of Armada, Inspiro, Soho, RockoPhoto or Oshine provide this ? I can’t see if they do. None of WordPress themes does offer this kind of functionality but WordPress itself does. WordPress allows to password protect pages or make pages available for registered users only. For more flexibility you can use some of membership management plugins but either way these solution will work with any theme. Therefore you can choose the theme you like the most and you will be able to get private galleries in place. I am Swami of Brand Exponents, author of Oshine theme. We have options for a password protected pages & galleries and number of photographers who use our theme, utilise this feature. I just quickly created a private gallery for your reference . Email me at swami at brandexponents dot com, if you have further questions. What is the texture over the picture from wildhorn called? Wildhorn theme has a simple semi-transparent background pattern applies using a pure CSS. My name is Alexandra Stan and i am part of the ThemeIsle team and i would like to thank you for adding Zerif Pro and RokoPhoto to this list. We greatly appreciate it. You nicely drew these themes here in your article . Reading this i got much information on these themes . Shopkeeper theme has many features that will be very effective for E-Commerce sites . Using Some plugins its ability of work will be entranced may be more. these are great looking themes – funny thing is that most can be accomplished by modifying a single theme. what really seems to mater with these are the hero images – as with most themes that use full pages sliders and backgrounds. they all stand out really well – but without great imagery even the best looking themes will look like crap. You are right about hero images. They are by far the most important part of your website in case you are using some sort of fullscreen theme. I have seen many websites using fullscreen layout with some low resolution pixelated images. It makes me cringe every time. Now a days there is a speech, ‘Theme is not a matter’. the matter is that firstly the theme must be all device friendly i mean responsive. On the other hand the themes have more effective features, the sites must be more effective. And visiting these sites traffics become satisfied. In this case the themes shared here will fill up the want of being nice and effective themes. Thank you author for sharing such nice and very effective themes here. We know the plugins add more functionalities to a site and help to make the site more effective. I am using TESSERACT, and use Beaver/SiteOrigin Builder . But, changing to another theme, displaces all the images and column. Also I don’t know why, when i use slider to display images, drop down menu hides behind the slider. Make sure to contact TESSERACT support team as we are not affiliate or in any way related to this theme. Please stop promoting this horrible fad of screen-filling pictures with minimal content, unclear navigation and enforced scrolling. Even if minded to explore, navigation is minimal and/or unclear. Scrolling is (probably) necessary to acquire more content, context and navigation. To me these sites are say “more work for the Visitor”. Maybe I’m weird (or maybe I’m a User more than a Designer) – but landing on any of the above, and 8 times out of 10 the next click will be the back button ! We have over 100 unique categories on our website that covers different WordPress themes and yet you decided to find the one which is specially made for fullscreen themes and complain about them. What about those other hundred or so categories on which most themes aren’t made to be full screen and also doesn’t have any of your mentioned problems? There are different users with different needs and many will find fullscreen themes the right one for them but they aren’t made please everyone. I really like these themes, but I can’t find a theme including space for just text. Some of these themes only show images and some have just like phrases. Is it also possible to add text? Less text always looks better but you can add a text if you want, that’s not a problem. All themes does allow using text on top of slider as well. Please can you suggest the best theme for Product Design, I was looking for masonry galley and full page project layout. I notice that most of the themes have the same project image visualization (window in the middle of the screen). I was looking for full screen. Thanks for the list! I have looked so many places for a minimalistic wp blog theme. Everywhere I look I find that it is most common to use masonry or grid layout, with excerpts and sidebar. Where can I find a theme where posts are shown in full lenght, just one after another, and with ‘sidebar information’ (ie. ‘about’, instagram feed, recent posts, related posts) located at the bottom or middle of the page? Almost all themes offer this by default. It is just very few people use this layout therefore most developers don’t even included in the theme demos. It is just a single setting if you want to use a full post or excerpt.